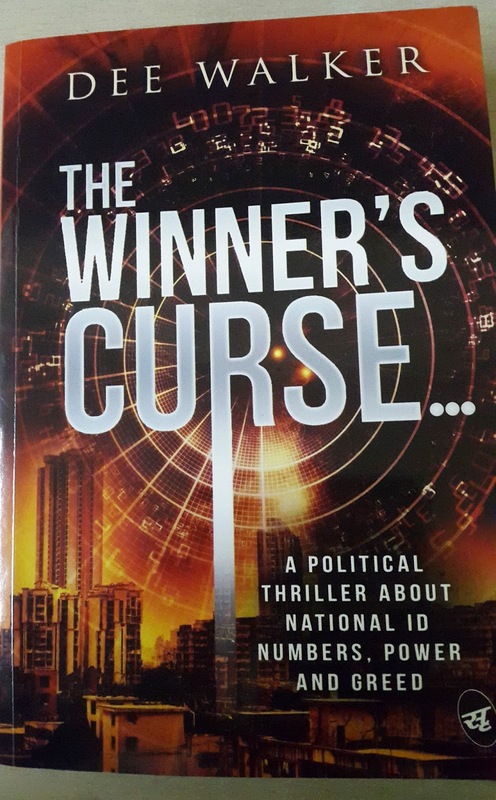 The Winner's Curse is a political thriller about National ID Numbers, power and greed which is written by Dee Walker who is an alumnus of IIT Delhi and published by Srishti Publishers and Distributors. I have received this author signed copy from Reader's Cosmos. Cover : Cover lacks intriguing quality. Though the picture of a metro city and some hint of computer language points out at the involvement of technology and engineering which is clarified by the tag line ' A political thriller about national ID numbers, power and greed'. The voyage of secrets,betrayal,trust and crime you are going to experience in the book is not revealed with the cover. Plot : The story is mainly revolves around Harsh Mittal a multi billionaire businessman enjoying patronage of the Master of the Popular Party Zoon Draboo. The Master wants to control the politics of India and regain majority in the coming elections with the help of Harsh who was an orphan whose destiny allowed him to study and conquer the IIT. Harsh is ready to do anything for his Master without asking anything in return and he did so with help of some old friends and foes. But the Master has some other plans to acquire his Guru Dakshina from Harsh.. What is he planning for Harsh? How Harsh fulfill his master's dream? Business rivalries, old friendships, money, power, ideals and conscience all are at stake in this thriller. Thriller : Introductions of characters is superbly done in this book with pointing at commandments out of Ten Commandments suitable for that particular character. First a hint of the character and then description of the background in a separate chapter have made these characters realistic and for readers it becomes easier to understand their psyche. The power game in business and politics showed beautifully. Reading abusing Hindi language felt bad but again it was important for character building in some scenes. Spoiler : The climax. Nothing hurts more than loose climax. The story which was taking turbulent turns with each passing page fell to a low in climax. It wasn't in haste but in laziness. I was expecting public uproar, News Now debating about heroism of few characters, nationwide demand for hanging the culprit,etc. Their are also some possibilities of love angles which was ignored in it. Verdict : Read to know how governments can exploit us by infringing our privacy and to affirm that Truth always triumphs. Rating : I would recommend it as one time read and would give 3/5.